Women riding motorcycles are quite rare despite all the talks of gender equality in the 21st century. 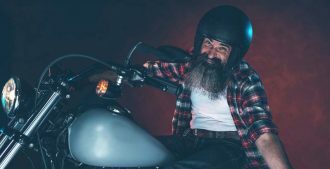 However, whenever a woman rides a motorcycle, she is automatically cooler, daring and more adventurous than the rest of her female counterparts. Motorcycles were never gender specified but the helmets certainly were for a long time. Those days are over. Today, on the market, you can find all kinds of helmets to fit exactly your needs. Whether it’s a full helmet, half helmet, open face helmet, you name it. You just need to know where to look. 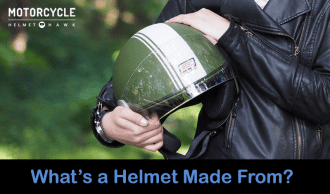 With the best in the class motorcycle helmets designed for women, you can be safe while riding your bike and also look pretty while you are at it. Here are some of the best in class. The full faced helmet from HJC is simple and elegant in looks. It has been constructed with advanced polycarbonate composite shell which makes it lightweight and will fit like a glove. The anti-scratch face shield featuring the new 3D design provides 95% U.V. protection. The shield closure system has been designed so that the shield locking system is extremely tight and secure. The Advanced Channeling Ventilation System makes sure that you get maximum air-flow flushing the heat and humidity up and out. It’s available in 5 different sizes ranging from X-Small to X-Large. The helmet will fit perfectly making it seem secure and despite its light weight, it will not budge in high speed and windy conditions. The cheek pads and liner are made of anti-bacterial fabric and are removable and interchangeable. It meets the required SNELL and DOT standards so you can be assured of its toughness for safety. You will barely hear any noise; it is super quiet and has a classy look. Since it’s a full faced helmet, you might feel a little claustrophobic until you get used to it. 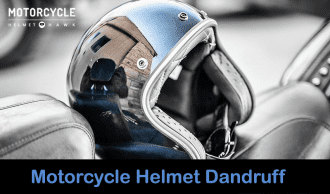 It does not provide you the freedom of half faced helmets and you will not need to turn your head completely to look anywhere other than the straight ahead. It’s a great looking helmet that is remarkably comfortable and lightweight. With this beauty, you will feel completely secure and also avoid unnecessary sunburn. The five different sizes available makes it fit for riders of all sizes. 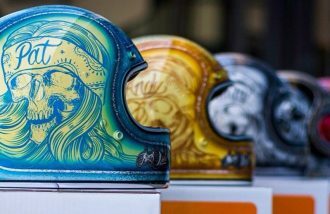 Ladies, you will definitely look badass with this full faced helmet. 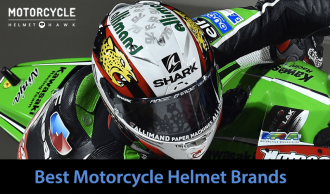 HJC full faced helmet looks good and is a top quality product. 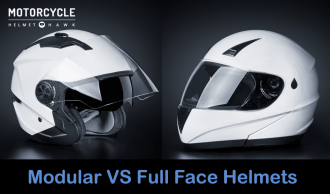 However, if the full faced helmet is not something you want to go with, there is always something else you can opt for. Keeping that in mind, here are the two helmets you should definitely look into. Bell Women’s Pit Boss Flames Motorcycle Half Helmet and GMax Women’s GM67 Open Face Helmet are definitely worthy of consideration. 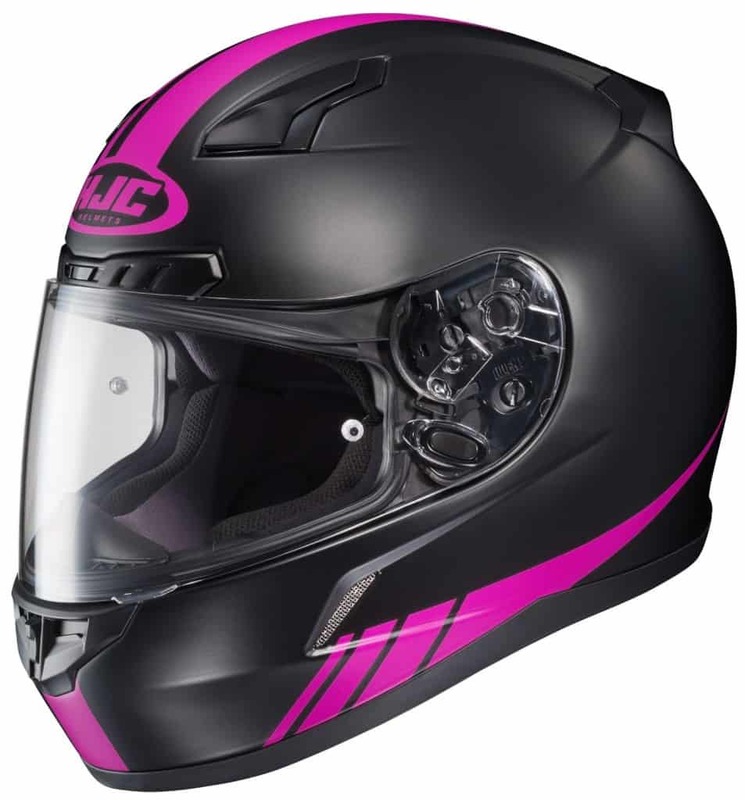 Bell’s half helmet for women is made from TriMatrix composite shell-Kevlar/Carbon/Fiberglass blend and is lightweight. It has been certified with DOT standards. It has been featured with internal sun shade to assure complete protection. The Pit Boss also features convenient pockets to fit your speakers. The product has the five year manufacture warranty from the company. The helmet is available in 5 different sizes; X-Small, Small, Medium, X-Large/2X-Large, X-Small/Small. The pit boss flames make the helmet look attractive with the slight touch of ruggedness. The lightweight helmet comes with interior sun shade that will protect you from both sun and wind. The interior liner is comfortable and is removable and washable so that you can maintain its freshness. It comes with removable neck curtain for cold weather riding. A half helmet is never considered to be completely secure. It leaves a large part of your face open. It will not fare well in case of rain or other harsh weather conditions. 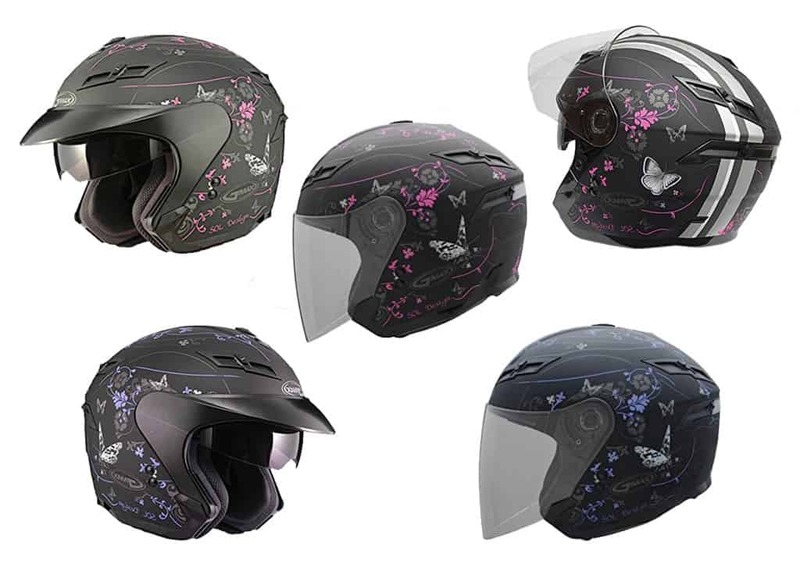 It’s a great helmet for ladies who want a bit of feminine touch with their helmet. It’s lightweight and comfortable. 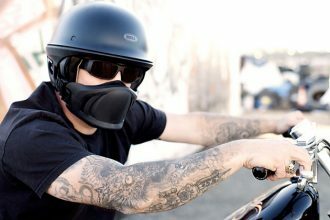 Whether you are a rider yourself or a back seat passenger, you will feel safe while looking good with this helmet. The price is well justifiable and the convenient pockets allow you to add your speakers or some other gear as per your desire. 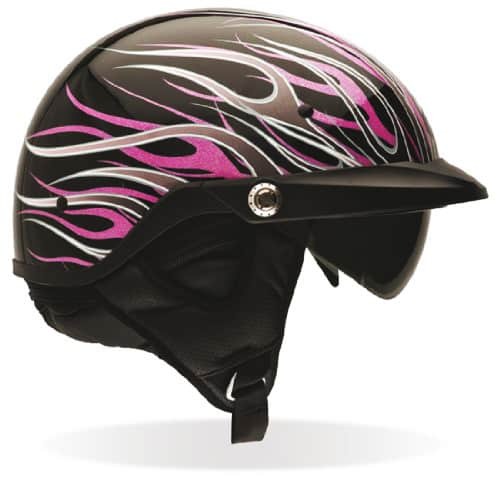 The open-faced helmet from GMax for women has been constructed with thermo-plastic alloy making it lightweight. 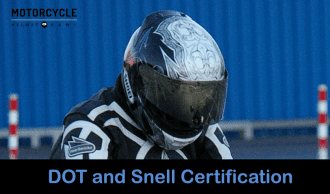 It is D.O.T certified. It features the black visor and the shield which can both be used at the same time, protecting you from the sun and making you feel safe. If you have a change of heart and want to go for the full helmet, you have the option to attach the additional chin. Also, an additional LED light can be added at the rear. It’s a good looking product with just enough feminine touch. It is available in five different sizes from Amazon in Pink and Purple. The design of the helmet is simple and attractive. The visor and the shield can be used at the same time and it is easy to use. 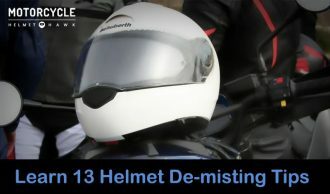 Additional chin attachment can be added to make it a full sized helmet and enhance safety. Inner padding is quite thin so the comfort of the rider is doubtful in the case of long rides. Due to its open face it leaves a large portion of your face open and is not as safe as the full faced ones. It’s not for new riders. It’s a great helmet with attractive design and won’t even cost you 100 bucks. The price is more than reasonable and the visor and shield along with its easy to fit ability makes up for its slight cons. It’s a great buy for ladies who want to look feminine while riding and want quality at a decent price. It is a must that you choose helmets keeping in mind its safety features, your riding habits and also the impression you want to set. 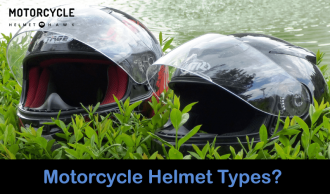 It does not matter whether it’s a full faced helmet, half helmet or open face, the important thing is that you like what’s on your head and you feel comfortable without feeling you have got an unnecessary load on top of you. After all, riding is all about freedom. 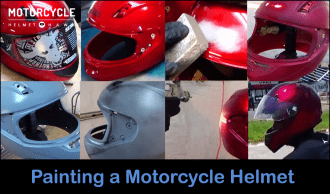 Go for the HJC CL-17 Streamline Full-Face Motorcycle Helmet. It looks good and comes at a decent price. Being a full helmet and strongly built, you can be assured of your safety despite its lightweight. Plus, you won’t be bothered with unnecessary wind noise while riding. It’s a complete product and you will not regret buying it. Of course, feel free to make up your own mind based on your requirements and desire. Weigh in the pros and cons and choose something you can be proud of.